A simple black gate on the Nepalese side transforms into a concrete castle on the Chinese side. A little shy, I walk past the guards in the hope that they will ignore me. And they do. The concrete building has two wings. On one ARRIVAL is written, on the other DEPARTURE. I go to the ARRIVAL terminal and am promptly called back by the Chinese Officers from within the building. “Not a step further, young lady!” I am put on a green plastic bench, and I wait. I write an e-mail to the travel company because my Nepalese sim is still working. They were supposed to pick me up from the border in the morning. Since Tibet is two hours ahead of Nepal, I left early. In the end, I arrive at the border around 9 o'clock (what I believe to be late), and still, nobody is there. I'm waiting for a total of five more hours because of a spelling error in my paperwork. The Chinese accept only perfect papers. My travel company seems to have its hands full as they forget me for four more hours. Everyone is friendly. It sometimes seems, exclusively to me (to the other travellers and the Tibetan guides, the officers are rude at best). I got my privilege back. It can have advantages to be a woman. After waiting for hours without information on my green plastic bench, while amusing the officers with a little uninspired ukulele play, one of the other guides takes me over the border. I am supposed to go with her group of 51 Russian-speaking tourists. At first, they are not at all thrilled that a stranger is mingling with them and begin to puff up like chickens. But since I can understand a little bit of Russian, I know enough to answer and introduce myself sneakily. Soon I see why they are so territorial. It's a wild mix of all ages from Russia, Ukraine and Kazakhstan on a kind of spiritual journey. I'm sitting in one of the last buses, with only women. The men have already left as they always make sure that they come first. One behaviour that I recognise. When I address the only remaining man on the bus for speaking perfect English speaker is still on it, turns out that he is Canadian with Kazakh roots (which explains why he cannot relate to Russian masculinity). It soon becomes clear that this group is a crazy mix of nationalities and characters who struggle to get along. A powder keg. At the hotel we get out, I get a single room with a bath and immediately breathe easier. The place is grubby and dark, but it has a door that I can close. I am drawn to the street. I still don't understand what this country looks like, how people live here and what it's all about. To my surprise, it's still light out, although it's almost nine o'clock. After my agency paid for my dinner, as an excuse to making me wait for 5 hours at the border and because their side made all the mistakes, I stroll through the streets of Ji long shè qu, the tiny place behind the security zone. 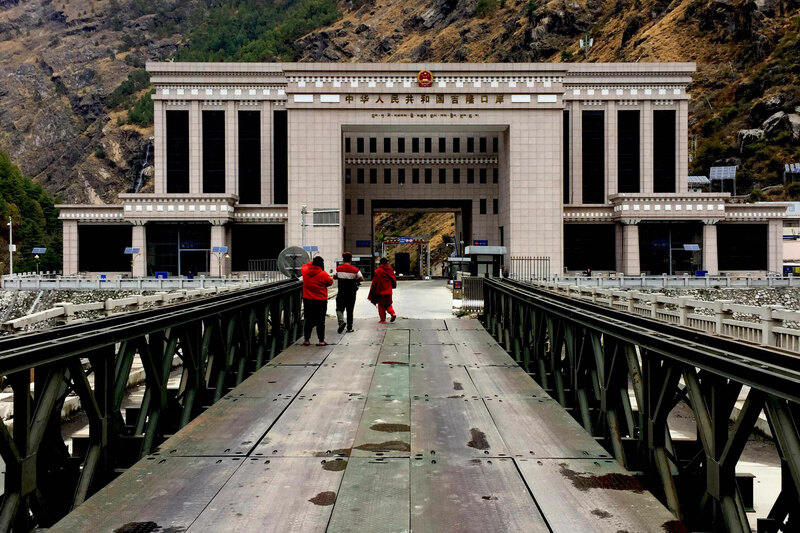 There, the loads are transshipped from Nepalese to Chinese trucks, so that they are allowed to drive through China. Here, for the last time, I hear the melodious and long horns of the colourful Nepalese trucks. The change of country is striking. Where rocky dirt roads lead to the border in Nepal, there are freshly tarred roads on the Chinese side. Like in Nepal, the mountains are steep and very green, the cows are free, and often enough I am not sure if they are not yaks. Maybe it's just yaks that got a haircut. After all, the animals are used for wool production in Tibet. I'm confused, but it's not essential. Every two kilometres there is a checkpoint where we have to get out and show our papers. It's a dance that turns into a routine fast. And even though I am travelling in a vast group, my solo travel always gets a comment.